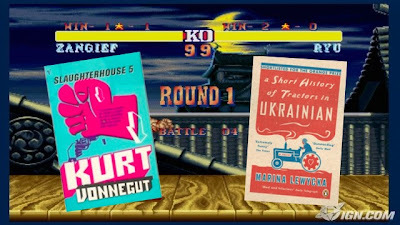 Book To The Future: Vonnegut VS Lewycka: FIGHT! I can't eat meat, and I don't drink. Note that I didn't say I'm a tee-total vegetarian. Thats something completely different. When I eat meat, my body switches into some kind of annoying standby mode for an hour while I digest. I find it hard to concentrate enough to watch TB in this mode. Cutting out meat gave me back two hours in the day, so it seemed like a no-brainer. As for the drinking, recently I've found that drinking causes a livid rash to appear over my feet. It's the same rash that heralded me going into hospital in 2008, except back then I thought it was an allergic reaction to pinching my flatmates washing powder. It wasn't; it was the first part of a massive vascular breakdown that almost killed me. So, recently, I've been cutting out the drinking. What these two things mean is that I'm not like you. I don't regard this non-drinking vegetarian lifestyle as making me better - being a vegetarian is like belonging to a rubbish secret club - but I'm not like you because I know I'm going to die. Unlike you, my number could come up at any time, no matter how much care I take. If you're reading this, you're probably going to get at least another 10 to 20 years of lifespan. I don't know how long I'll live. I have no guaranteed survival. Prior to 2008 the greatest threats to my lifespan had been cycling in heavy traffic and putting my trousers on at the top of the stairs. Which is why A Short History of Tractors in the Ukranian is, for me, such a repulsive book, and why Slaughterhouse 5 is so great. A Short History of Tractors in the Ukranian is about people who all fail; about a humanity who are never any more than their history, and who are to be laughed at for their very human nature. Slaughterhouse 5, on the other hand, is a picture of humanity who fail, are miserable, sometimes evil, often misunderstand each other, but are still, somehow, worth examining for their wonderful individuality. You'll excuse me if, during my short time here on earth, I choose to see humanity in the way that Vonnegut lays out.